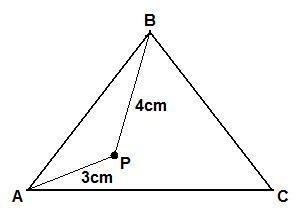 ABC is an equilateral triangle and P is a point in the interior of the triangle. We know that AP = 3cm and BP = 4cm. Prove that CP is less than 7cm. Generalising. Locus/loci. Triangles. Mathematical reasoning & proof. Working systematically. Games. Visualising. Interactivities. Creating and manipulating expressions and formulae. Cubes & cuboids.